Come join us for the UNC Science Expo on Saturday, April 6th, 2019, from 11am until 4pm. 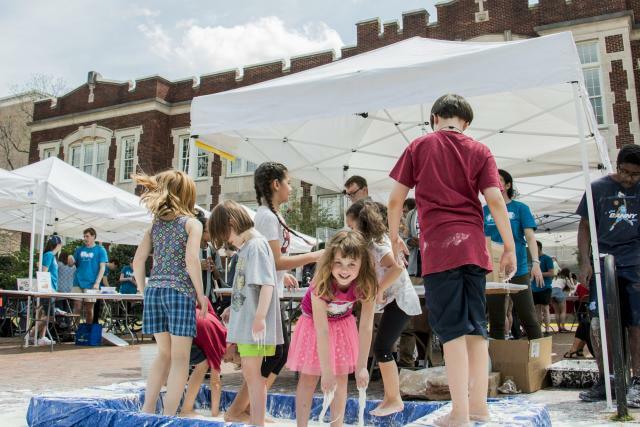 This annual celebration of science features over 100 hands-on activities and science demonstrations lead by STEM students, researchers, and practitioners from UNC-Chapel Hill and the Town of Chapel Hill. Build your own squishy circuit neuron model, test your mettle in the Department of Psychology’s “cold water challenge”, take a look at insects under an electron microscope, make your own ice cream, and so much more! The UNC Science Expo is your chance to get up close and personal with cutting edge science at UNC Chapel Hill – from the 30 meter wave tank in the Marine Sciences lab to the virtual reality and robotics demonstrations at the Computer Science department. This year’s event will also bring out your artistic side as you learn about The Beautiful Brain and the 27-foot-wide Crouching Spider statue. And if you need to take a break, grab a bite to eat at our food trucks and sit down to enjoy one of our science demonstrations on the Solar Stage. You won’t want to miss our (unofficial) attempt to break the Guinness World Record for the Galileo Cannon!